A man was sleeping in his apartment on Riverside Avenue when he heard the sound of shattering glass. He went to the window and saw a man standing at the United Jewelry Store across the street. The man was taking diamonds from the window display, “one at a time, and placing them in his pocket.” The witness called police, who raced to the scene. As police approached the store, they saw a man a few blocks away on the sidewalk who matched the burglar’s description. They stopped him, searched him and found 14 diamond rings valued at $3,000. The suspect, J.O. Peterson, a 40-year-old railroad laborer, said it was all a mistake. 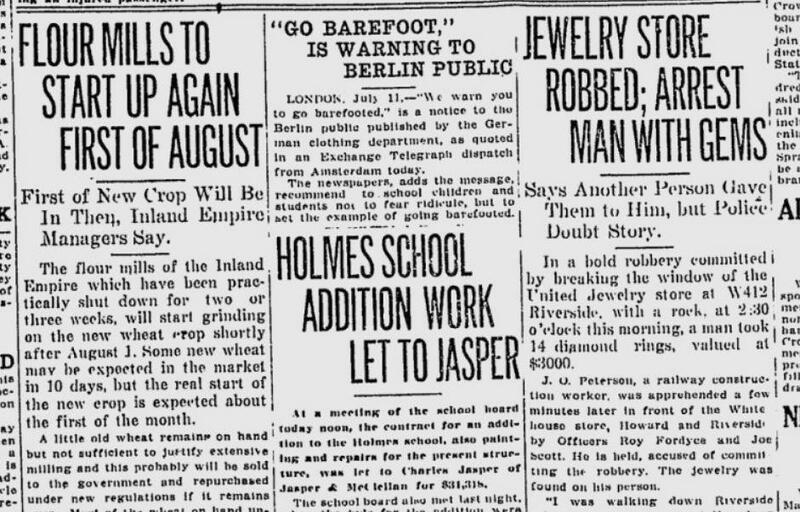 “I was walking down Riverside when a man came running along and as he passed, he shoved the diamonds and a big rock in my pocket,” he told a detective. Peterson was booked on a burglary charge. From the war beat: The Spokane Chamber of Commerce and the Washington Water Power Co. were offering the use of the Natatorium Park plunge (swimming pool) to teach Fort George Wright soldiers to swim. The Fort Wright commanding officer said it was important for every American soldier to know how to swim. “The casualties in France from soldiers wounded and falling into shell holes which are nine to 10 feet deep and filled with water, is greater than from actual gunfire,” the commanding officer said.